A rugged flanker and sometime lock, Bob Mordell is the only England international to be born in Twickenham. 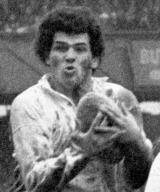 He made his Test debut against Wales in the opening game of the 1978 Five Nations, conceding a late penalty which allowed Welsh fly-half Phil Bennett to seal victory. He did not play for his country again and eventually signed professional terms with rugby league side Oldham. Two years prior to his international debut Mordell had courted controversy at Twickenham by being sent off for punching during Rosslyn Park's defeat to Gosforth in the John Player Cup final.